We invite you to explore India - the Land with infinite beauty ! Whether you soar high into Himalayas or peer under the ruins of the Ancient monuments dotting the landscape of India, you will cherish the experience long after your visit ! This India Travel Guide on Charminar is free from any commercial interest! This site is dedicated to promote India - the vast subcontinent, its glorious past, magnificent landscape and its infinite variety. From a distance, Charminar appears imposing, sturdy and majestic. As you draw closer, it emerges elegant and splendid. Charminar in Hyderabad, the capital city of Andhra Pradesh is often compared with the Arc De Triomphe in Paris. The workmanship is one similarity. The other is that both were built to honor victory, prayer. Just as Arc De Triomphe is regarded as the most iconic of all French monuments, Charminar is regarded as the most magnificent structure built by a King of the Qutb Shahi dynasty. The interiors and exteriors with intrinsic designs are impressive and splendid. With steps being taken to make the area pedestrian friendly and vehicle free, a visit to Charminar is sure to be more enticing. Sultan Muhammad Quli Qutb Shah, the 5th ruler of the Qutb Shahi dynasty built Charminar around 1591-1592 shortly after shifting the capital from Golkonda to Bhagyanagar, erstwhile city of Hyderabad (old city). Legend reveals that Charminar was built as a token of thanksgiving to Almighty. During King Quli's rule, the dreaded disease plague ravaged the city. The King prayed for the wellbeing of his subjects and took a vow to construct a mosque. After the successful elimination of the epidemic, he built Charminar meaning masjid of the four minarets. History reveals that while laying the foundation of Charminar, the king prayed 'Oh Allah, bestow unto this city peace and prosperity. Let millions of men of all castes, creeds and religion make it their abode'. Today, the cosmopolitan city is home to people of different religions living in peace and harmony. The architectural style is predominantly Islamic Cazia style of architecture comprising granite and lime-mortar. It is believed that the design is based upon Shia 'tazias' which is a representation of the tombs of Hasan and Hussain (the grandsons of Prophet Mohammed) that is carried in processions during various Islamic festivities. Granite, lime, pulverized marble and mortar have been used in the construction of the majestic building. The Charminar has four floors. The first floor was used as a Madarsa (School of learning religious Islamic literature) around the year 1888. From the balconies of the first floor, one can get a spectacular view of the historic city. Charminar is square shaped with four towers or four minarets, one each on four corners. These are said to indicate first four khalifas of Islam. Each minaret is 56 meters high with a double balcony and crowned by a bulbous dome. Inside the minarets are spiral stairways with 149 stairs that lead to the very top, an open verandah. Dainty petal-like designs adorns the base of the dome. Each minaret opens into a plaza through giant arches. The arches face the four directions, East, west, north and south. All the arches have clocks on their upper parts which were erected in 1889. On the western end of Charminar's roof is a beautiful mosque. The remaining space was used as a court during Qutb Shahi Quli's reign. The mosque is regarded as the oldest mosque of the city. In earlier times, Muslims prayed here but not any more. Weather-wise, the best time to visit Charminar is between October and March. But visiting Charminar a day before the Jumaat-Ul-Vida or Alvida - the last Friday of the holy month of Ramzan promises a unique experience. With Id around the corner, the area wears a festive look. Timings: 9 am - 5.30 p.m. (All days). Most spectacular view: When Charminar is illuminated after sunset, it looks more splendid and beautiful. Must-do things: Stroll through the bazaars. 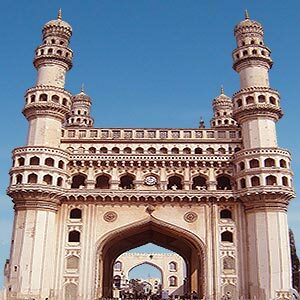 Many interesting items such as Hyderabad souvenirs, perfumes, lac and glass bangles, pearl sets and hand-embroidered dress materials are sure to catch your attention. Must-taste delicacies: Sumptuous treats in the form of a rich blend of royal Mughal flavors, Nizam special and other culinary traditions of South India. The most famous is the traditional Hyderabadi mutton haleem and jalebi. Other places that you can see in the area are Mecca Masjid, Jama Masjid, char kamaan and Miya Mishk mosque, chow mohalla palace, Khilwat Mahal, the Malwala palace, the Salajung's dewan devdi and Purani Haveli.